Airing My Laundry, One Post At A Time...: I Got A Lobster Hat For Christmas! 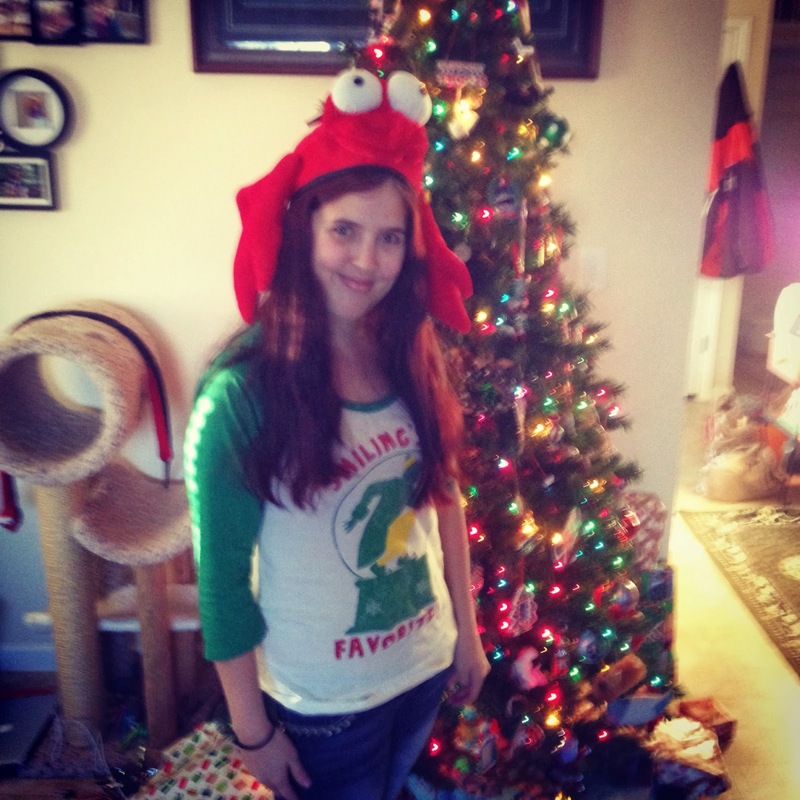 I Got A Lobster Hat For Christmas! Tom and I like to get each other silly gifts. Actually, this was given to me the day BEFORE Christmas. On the REAL Christmas, Tom woke me up at 8. I am not a morning person. If I can avoid getting up early, I will. I am thankful my kids aren't the types that come in at 5 AM expecting to open presents. That wouldn't fly with me. Natalie was equally surprised to get the Crystal Palace. That's a Grumpy Cat and a giant chocolate bar, for my rough days. I got a giant chocolate bar last year, too. Tom must've thought I could use another one. He knows Natalie's attitude. Tom got lots of things. Here's him unwrapping his Grill Daddy. I guess it's supposed to clean the grill better? I dunno. I saw it on Amazon and thought, "It deals with the grill, Tom will like it.."
After cleaning I was like, "Wait, I have to cook today too?" I managed to make a meal. We had a fantastic Christmas. We'll take all the decorations down this weekend. Glad you all had a good Christmas! And we got the Frozen palace too. Did you put it together yet? Scarlet waited very patiently, in her Elsa dress no less, while he took eons to put it together. And it's huge! She loves it, though. looks like you had a good one! I'm glad! LOVE when we are able to pull off surprises like that...the looks on their faces make it so worthwhile. Glad you had a great Christmas! I always leave the decorations up until after the new year. 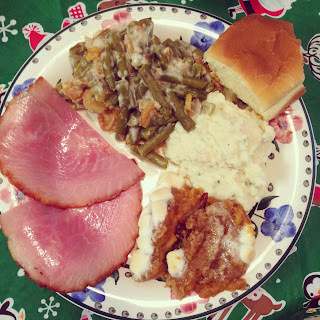 Yay for lovely and fun Christmases! I love seeing kids so excited about their presents! Looks like a fun morning (even with the cleaning), and I love the kids' pyjamas! What a great day. I need an update on the wiiU, interested if it's worth it even if you have the wii. Cute hat. We saw some lobster hats when we were in Maine. I got a pic of my daughter wearing 1. I would love to get a giant Hershey bar. Maybe I'll put it on my Valentine's day list. That meal looks delicious!! I was fortunate to not have to cook a meal for an entire week! I did help with dishes though! I think the giant chocolate bar will come in handy. A total win! Looks like Santa found you all well. And the grumpy cat? Ya. I totally love that. I have an ER doc that calls me the every morning at 0600 when I walk in. That's the biggest Hershey's bar I've ever seen in my life!!!!! And I NEED that grumpy cat, ASAP! Bet you are still working over that large Hershey Bar! That was totally awesome. Almost as awesome as the silly hat. Woo Hoo!! Awesome Christmas!! And Tommy's reaction - LOVE IT! !